Millbuies Beech SH - "BEECH"
Beech was imported from Scotland in 2007. Beech is a wonderful working dog who was run in several puppy stakes in the UK before being Imported into the USA. In these puppy stakes' Beech had two wins, as well as a couple other placements. Beech spent last summer running AKC hunt tests and acquired his Junior and Senior Hunter titles. He is taking the fall off to go duck hunting and living the good life. He too has a great temperament and personality. Quiet, calm and easy going with the family but gives his all when asked to retrieve his birds. He is passing on his great temperament and tremendous bird drive to his offspring. He is an excellent physical specimen of a Lab in great working condition. Recently we were given the opportunity to Breed to Beech. It was a pretty easy decision, and we jumped at the chance. 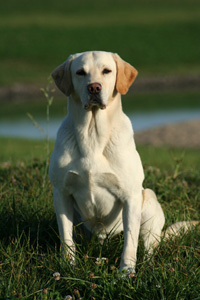 Beech's confirmation is excellent, with a very attractive square head, broad chest, and extremely muscular feature's, making him an excellent example of a properly bred British Field lab. Beech is a very well behaved, true gentleman, with a nice thick coat, and the classic "otter tail". His weight is 68 lbs. Beech's drive is as hard on blinds, as it is on marks, over land or water. When he was on the British field trial circuit, he was know as one of the best lining dogs out there in a long time. Its hard to believe that a retriever with this much drive can turn it off but Beech can.